Tommy Milner: Race day arrives, and I’m feeling good. The start looked like it was definitely going to be wet, and it was. 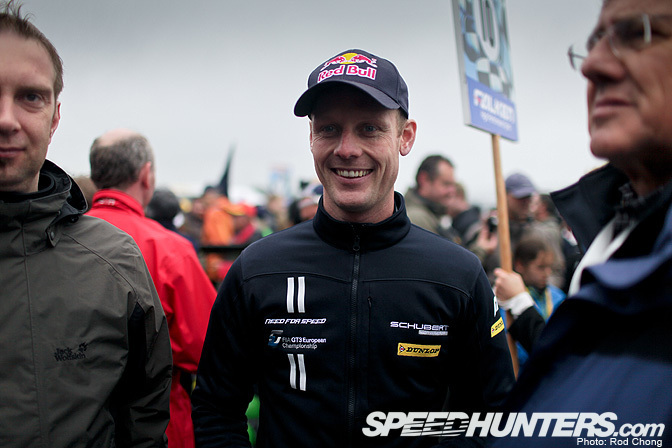 Edward Sandstrom: I was relieved that the race would soon start. I felt in good shape and the experience from last year made it easier to prepare. There was a big chance it would be warmer this year, so I really tried to be prepared. But actually, you learn from this sort of race how you personally react. I think it isn’t the same for all of us. During two hours driving some lose a lot of body liquid and some don't. I’m loosing a lot when my pulse is around 160 all the time. TM: The atmosphere on the starting grid was really amazing. 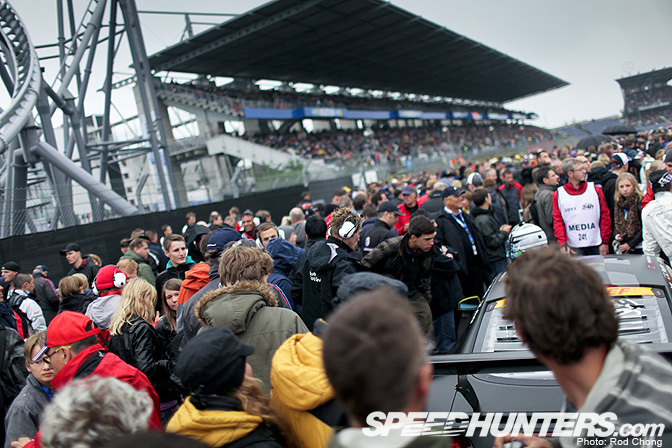 There were thousands of people on the starting grid for sure. It was tough to walk around. 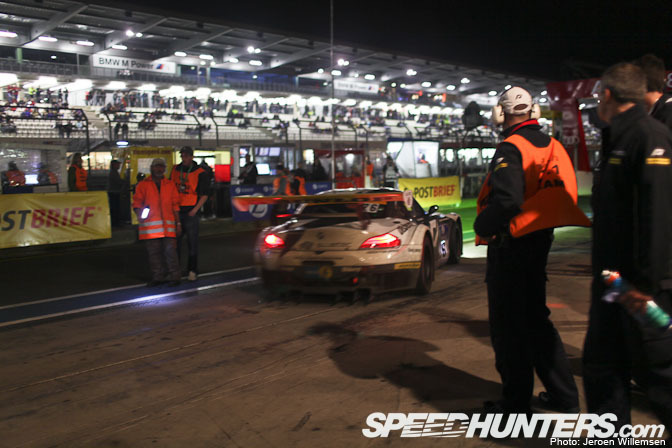 ES: There are more people watching the start of the 24HR than when Formula 1 is here. Really cool to see the big stadium completely crowded. 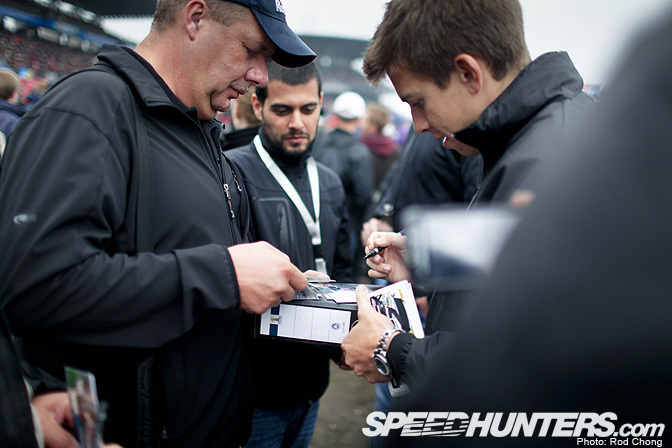 I must say the fans are so dedicated to the race and that gives a great feeling. I want to do this race over and over again.There is so much to learn and I’m just eager to get more of this. 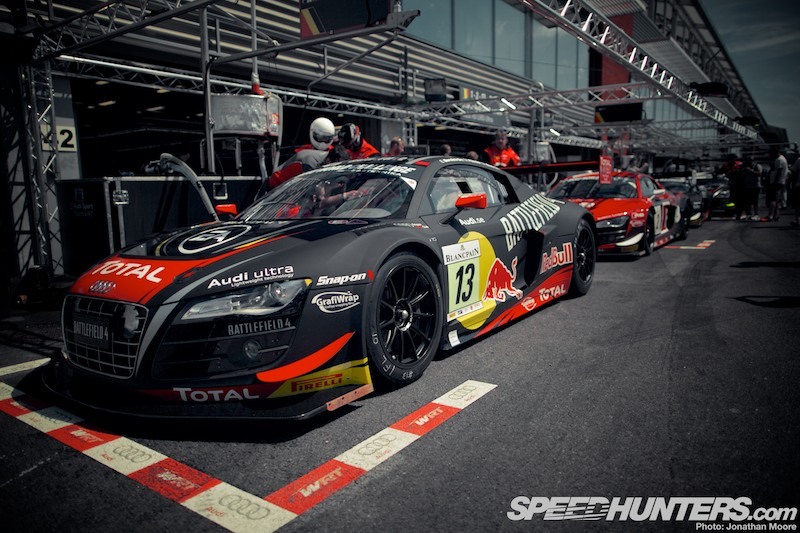 ES: You can see the E-Postbrief Audi R8 LMS behind us, maybe Team ABT didn’t expect that! 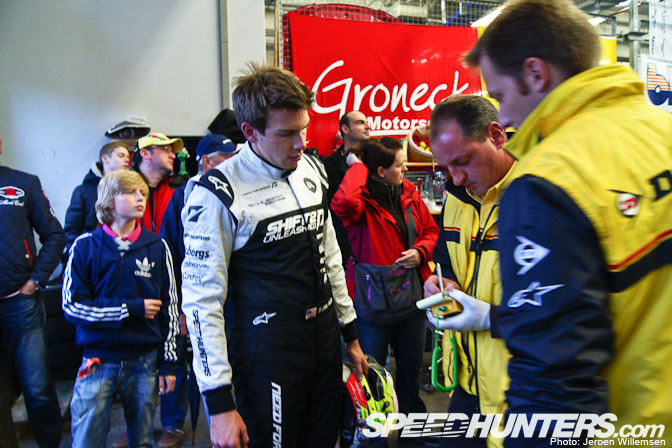 I use to go to see some of the DTM races that Mattias drives each year as I found it interesting and we like hanging around together. 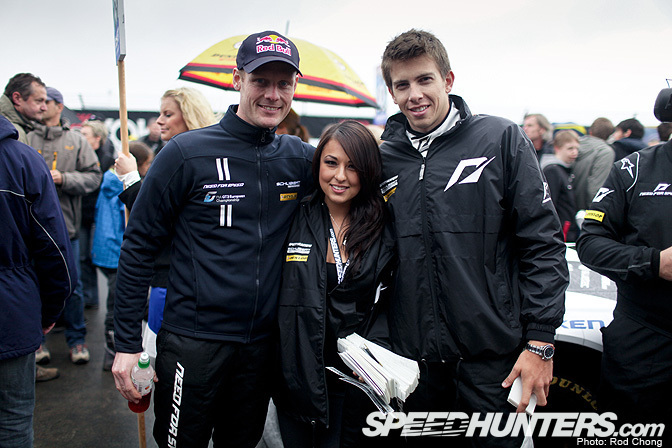 TM: Claudia started in Dubai and she had the starting duties here at the Nurburgring. ES: Claudia is actually one of those racers that has a really good overview around the car and that makes her excellent when the battle gets tough. I must say I was really relaxed to have her in the car for the start. TM: We wanted to adjust the seat a little during the weekend to get a bit more comfortable in the car but with the engine change and other last minute items the only time left to fiddle with the seat was on the grid. ES: Last year I had cramp from the seat position. Luckily we had time to change. It’s hard to make everyone happy when the spread in sizes are so huge. TM: We ended up just tipping the seat back a bit to get more comfortable. Not the best time to do it but regardless it was nice to know going into the race we would be a bit more comfortable. ES: The late adjustment gave more support for the legs. ES: As you can see I have a big smile on my face. I had really good thoughts about the car and the performance for the race. But as always you know it’s gonna be tough and you need some sort of good luck along with reliability as well. ES: But I think I won the competition in giving away stickers. Maybe Miki wants a rematch next year? TM: When I first started racing I’d be a bit nervous but now I know how the day flows so I’m pretty relaxed before the race. 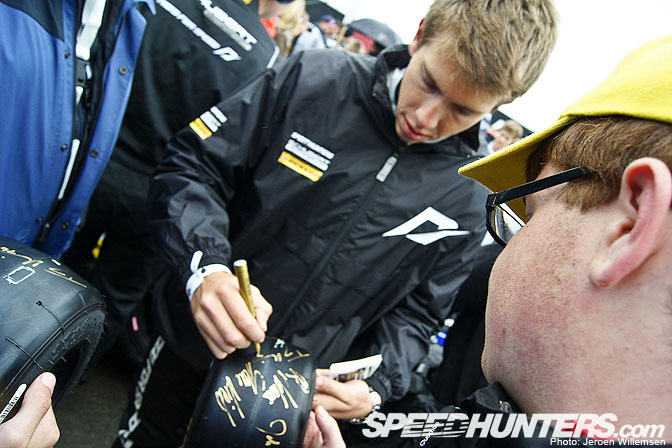 TM: It was pretty cool to already have some of the fans have me sign pictures of the Corvette at Le Mans. TM: One guy even had pictures from every car I’ve raced. 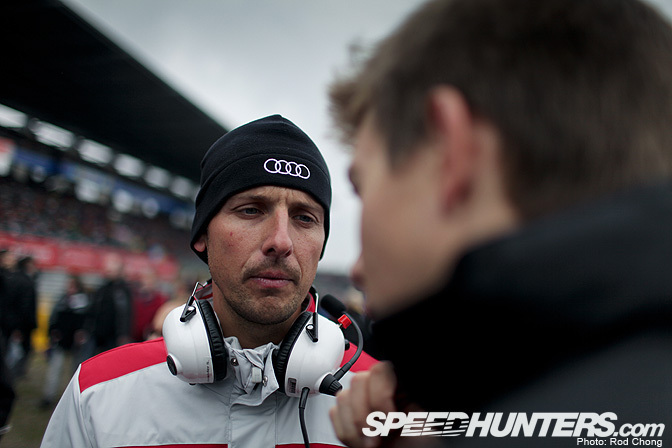 TM: The engineer from one of the Audi’s came up to me before the race to chat about the first qualifying session. 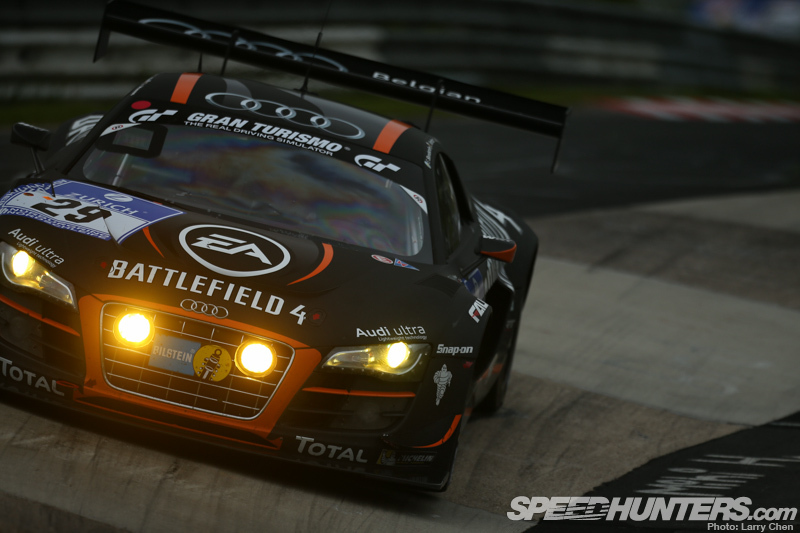 I was just ahead of one of the Audi’s for the qualifying lap and he wondered why I didn’t let him go… I’ll keep it in mind next time… or not. TM: Go time. The track was wet and most of the cars started on full wets. Some started on intermediates. The ones on inters fell back pretty quick while the track was still wet. Then the track started to dry and it would be time for dry tires pretty soon. 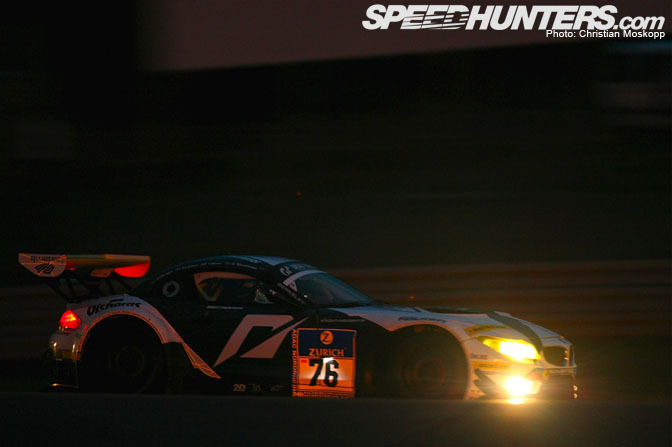 ES: Claudia did very well and was around position six/seven through the whole stint. She had a small contact with one of the M3s but luckily nothing happened. I was driving as number two and was following her progress on the rain tires. 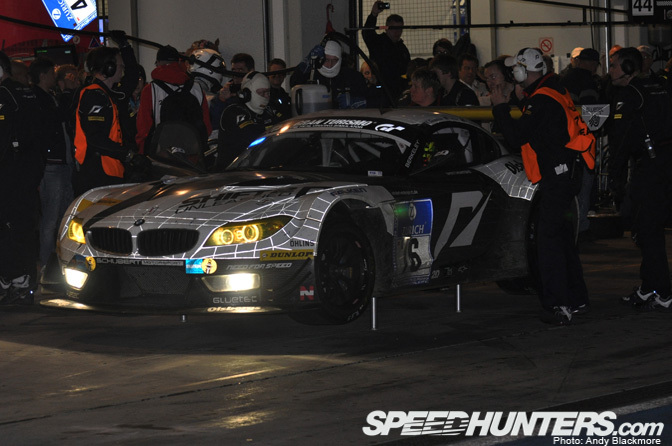 She went in quite early to change for slicks which also made her stint a bit longer. TM: My first stint was pretty tough. There were quite a few yellow flag sections and it makes it very difficult to find a rhythm. 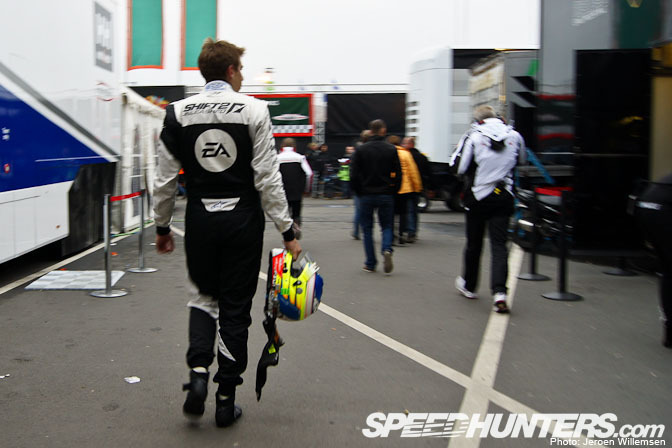 My last two laps were clear though so I felt a bit better about the next few stints. 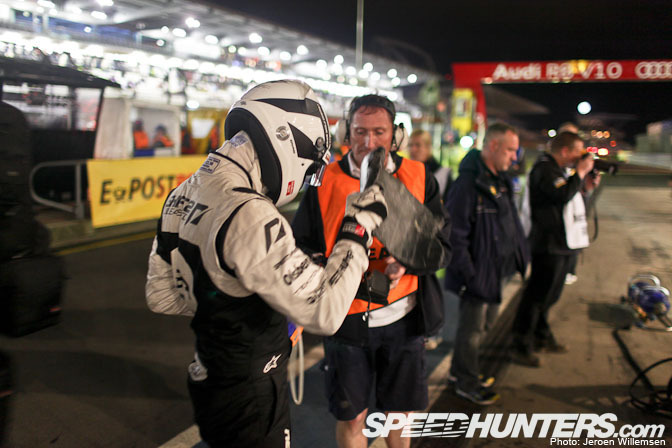 TM: The plan was to just do single stints to start the race and then in the night time do double stints. Claudia was having to split between two cars so it was Eddy, Freddy, and my job to go through the night. TM: These first stints are just about figuring out what the car is doing and get used to the traffic, and staying out of trouble. TM: I’m just out of the car and I want to see where we stand. 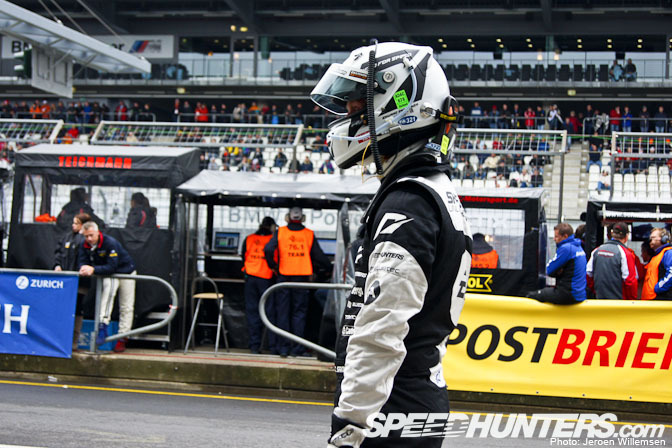 With the rain at the start the order was all jumbled and hard to read with people on various pit strategies. TM: The tires are obviously also a very important piece of the puzzle and Dunlop was keen to know what was going on with the tires. TM: I felt like the soft compound we were on was getting a bit abused so they went to the medium compound for Fredrik. There was a chunk missing from the inside tread, which we were discussing here. TM: The tires are such an important part of making it to the end cleanly and without problems, so the little issue we had here was a small worry but Dunlop was sure it wasn’t a huge issue. ES: I actually had some bad understeer during my first stint so I was listening to what was being said about the tires. 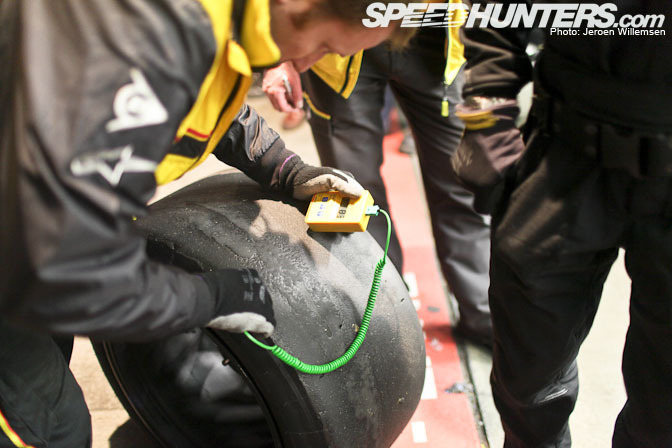 ES: The people from Dunlop always check temperatures from inside to outside, the wear of the tire and how it looks. After years of experience, I think you can see pick up a lot of information only with your eyes. This is really sensitive work and you have to have the eyes for it. TM: Next, I had a chat with Stefan our engineer about the car balance and what we might need to do to help dial the car in on the next pitstop with tire pressures or tire selection. 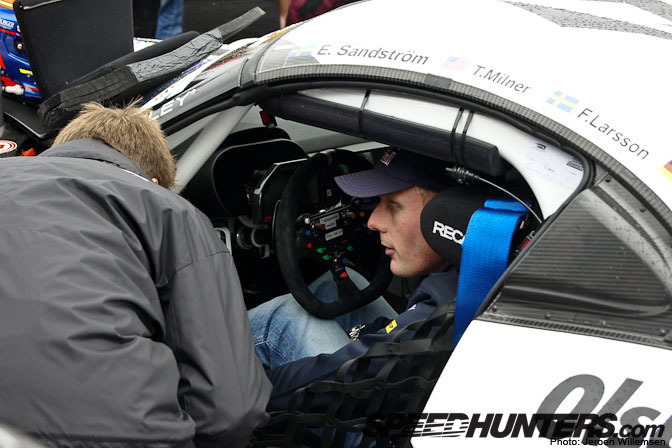 TM: With Fredrik in the car, Edward and I were just talking about our stints and how the car was. TM: Every lap is crazy here at the Nurburgring so I’m sure there is some story here being said about a close moment on the track. 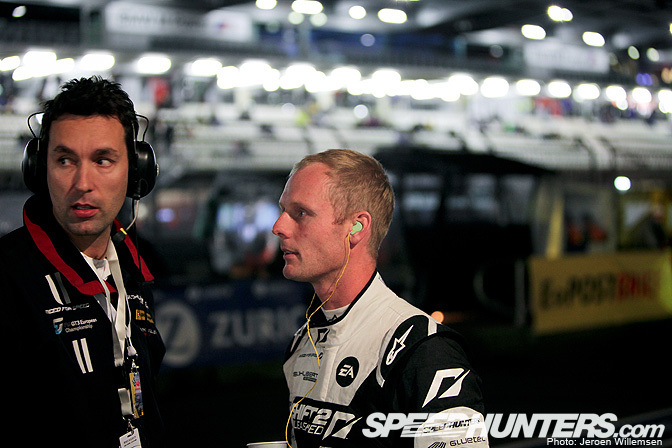 ES: Olaf from BMW Motorsport looks concerned. You can have some small moments all the time when going through the traffic or more or less it’s really tough to avoid it. This is why you can’t have enough experience for this race. TM: Once all my quick meetings are done with I can head back to the truck to get some food and drink before my next stint in the car. TM: The great team at Schubert had some pasta waiting for me and helping me get the water I needed to mix my recovery drink. I felt fine getting out of the car but I wanted to make sure I stay as alert and aware as possible. 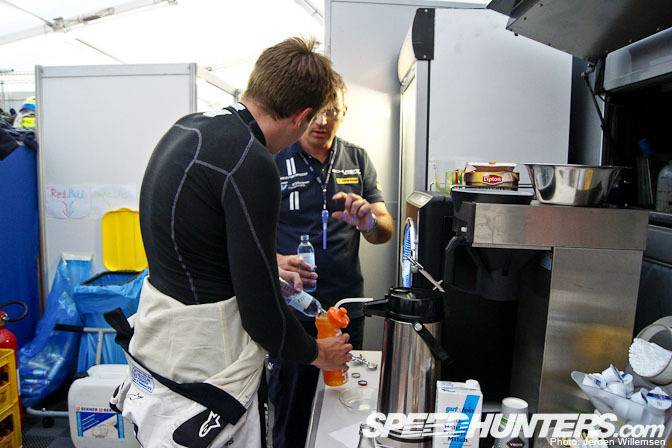 TM: These little drinks and things are all important to make sure we’re as fit as possible for our stints. 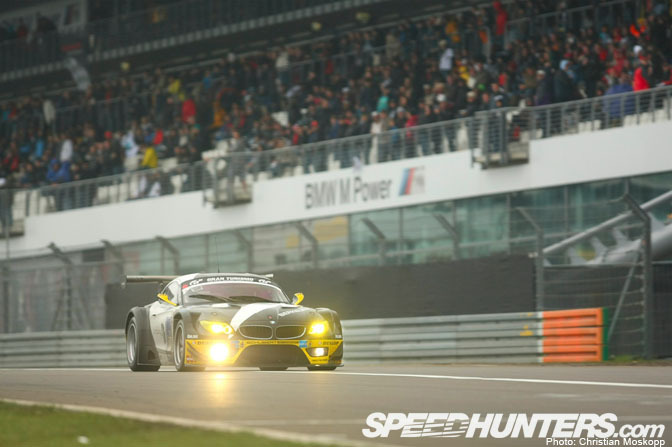 TM: Schubert had three cars entered with some very, very good drivers. 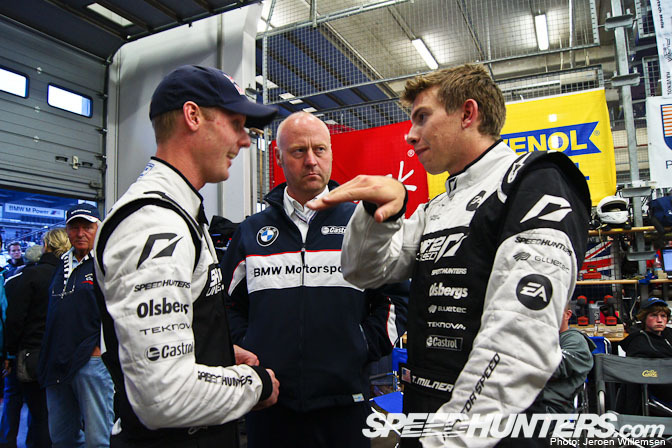 Tom Coronel, who I’m chatting with here, was asking about my stint and how the car was. Tom is a great guy and was a great part of the team. 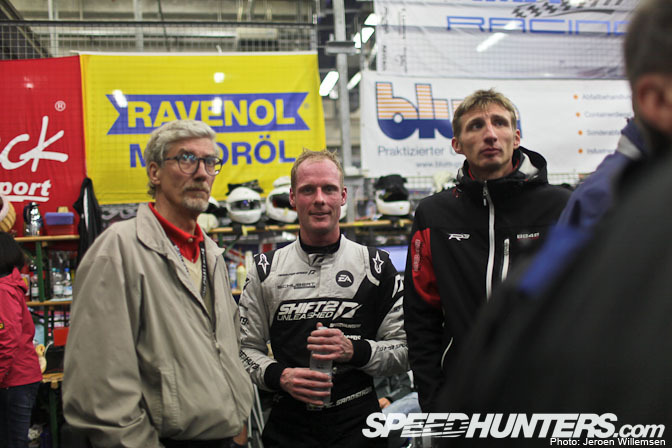 TM: Tom was driving with Marko Hartung, Jorg Viebahn, and Claudia. They had a great race and were never far behind us during the race. 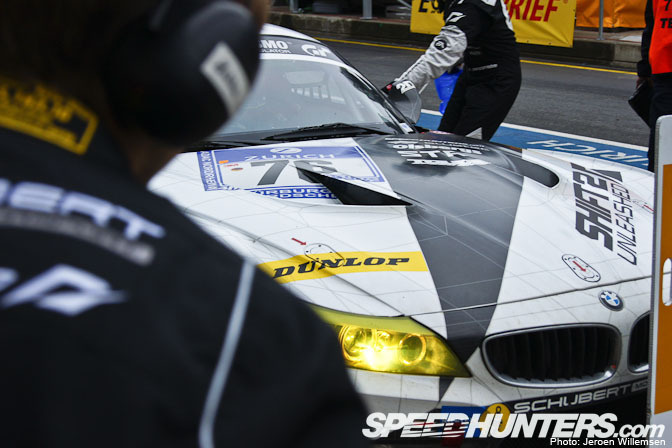 TM: My second stint was also frustrating with the yellow flag situations. I was in the car when one of the cars had gone over the barrier and again it was so difficult to settle in to a nice rhythm. The organizers were very strict about driving too fast through yellow flag zones so it was tough to tell if I was keeping pace with the leaders despite having to go very slow through these sections. ES: I had adjusted the drink system in my helmet. In the first stint water just sprayed my face in the fast sections when the g-forces opened the check valve. I can tell you that the microphone didn’t work very well in combination with water. Quite a disaster if you’re about to give information about used fuel every lap and to see if you can manage another lap. Now at least this was sorted. ES: Still beginning of the race. We have to pick up the pace to progress but at the same time without unnecessary risk. How do you do that? I think the only way to do it is to drive as fast as you can every single corner when you’re out of traffic and then slow down slightly in traffic. What you can control on your own you can stretch a bit, but traffic you will never be able to control. Then of course you pick up areas of the track where the traffic is more intense and the space and possibilities more dangerous. I would say it's about experience and if you can keep cool enough. ES: Ready to go. I will change with Freddy and the track seems to be free from yellows so I hope to get a better stint than the first one. ES: We have alsoe changed tire compound and I hope it's going to work better. 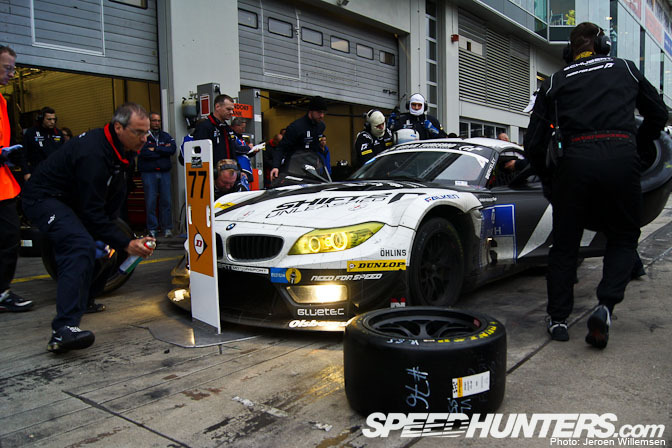 ES: All the team do their great work to keep the Z4 in perfect shape. I put the camelback in the pocket inside of the door. Freddy out and me in. ES: Stefan always helps me to tighten the middle strap a bit. I like to be fixed in, so I can concentrate on pushing the throttle. TM: To equalize all of the different cars and fuel capacities, everyone took about 2 minutes 20 seconds to fill the car up with fuel. This gave us plenty of time to get the tire changes done and do any necessary cleaning or work on the car before we could go back on track. ES: You have pre-heated tires so you can just to start get in rhythm from the first corner. ES: Flugplatz is the name of the corner. Everytime the car is airborne a bit and just hundreds of a second later you start turning in to the corner in fifth gear. It’s a bit insane but when the aerodynamics work these corners are just crazy fun. It’s all about believing in the car and try to not upset it by going off the throttle too fast. Here you don’t brake on a fast lap. In practice when the front got loose, the bonnet was moving up and down a lot going in here. That was less fun. 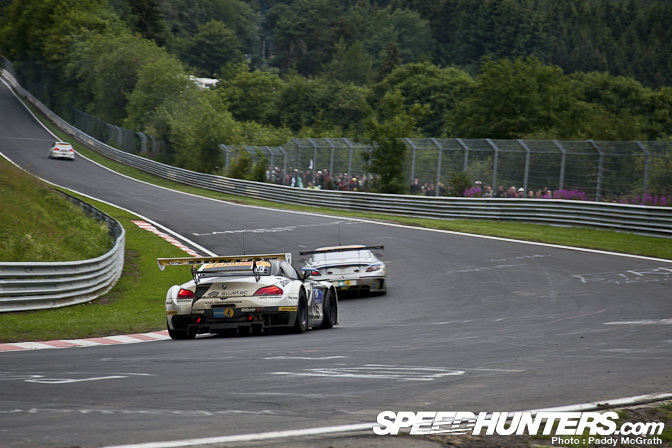 TM: Just some of the magic that is the Nurburgring. We get airborne at least three times per lap at some very high speeds. 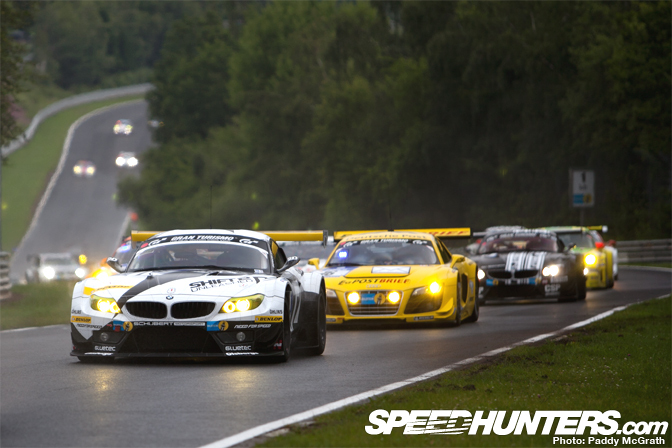 TM: The second car was only a few places behind us at this point in the race. We were running top 10 really once the pit lane stuff settled down and then heading into the night we were running top 5. TM: At this point, all was going well. We were running a good pace, not the fastest, but very competitive and our consistency started moving us further up the leaderboard. ES: My second stint was way better and I could really use the car better. Still at the end of the stint the yellows were out again. But overall it felt much better and the weather was on its way to getting warmer. 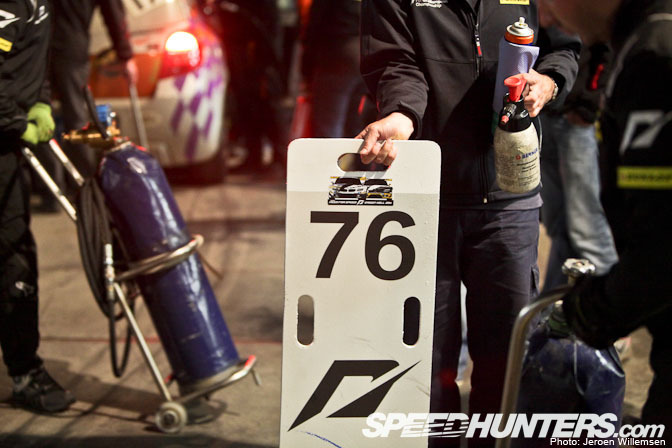 That would be our ace card as the Dunlop tires work better than many others in hot conditions. 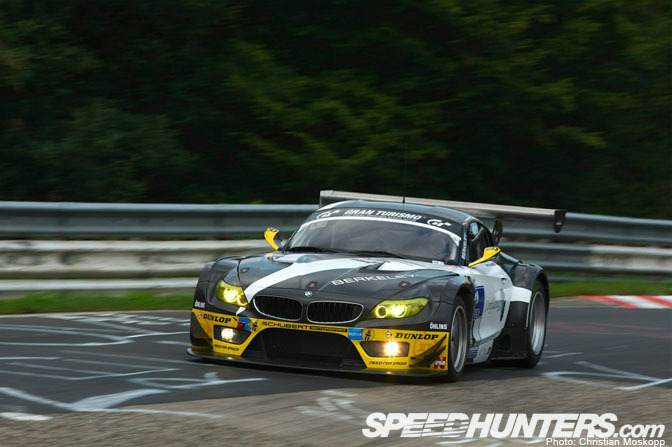 TM: The new 2011 Z4 GT3 car is a pretty big improvement over the 2010 model I drove in Dubai. Downforce wise it’s more than I’m used to in the Corvette in GT2, thanks to the leniency in the rules, and it’s really a nice car drive. ES: Wider body and wheels and a huge rear wing together with a lot of small fixes have made the car even better. TM: Check out the exhaust pipes running red hot. Pretty cool to see. TM: Not to mention the brake rotors glowing red too. It looks like we had a pretty good amount of front brake bias in the car. ES: Everything worked fine running into the darkness. I remember from last year it was a bit different to drive when everything was complete dark, but now it felt easier. Better knowledge of the track make sense I guess. 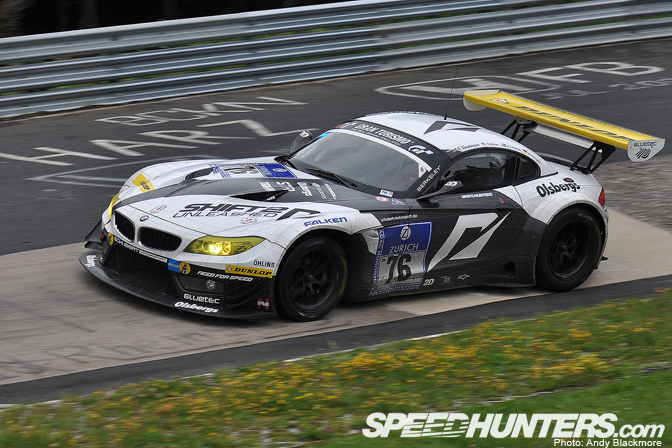 ES: #76 we have used both last year at the N24 and in Dubai. 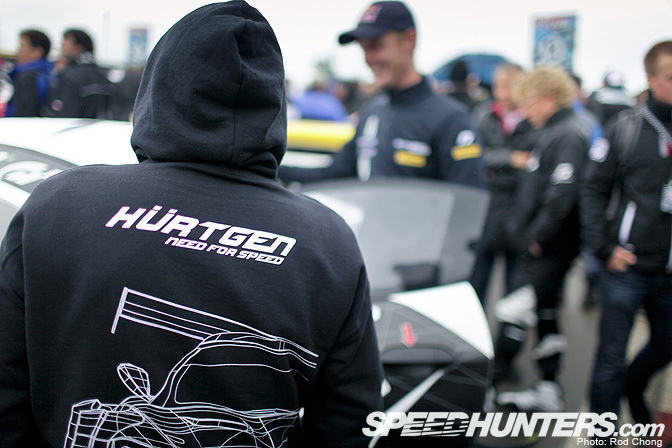 Something like a trademark for us when it’s about endurance racing. 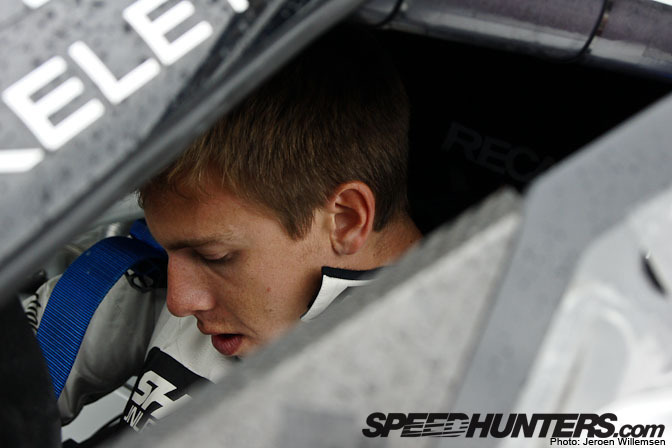 ES: Mr. Torsten Schubert the owner of the team. He must be pleased so far with one car in the top fight and one just behind. Even then he is as ready as always. 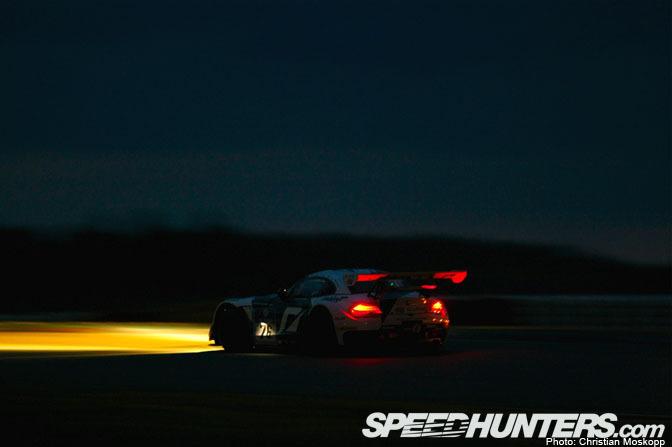 TM: My first stint in the night and it was pitch black. I had some laps in practice in the darkness so I was confident getting in. Unfortunately, AGAIN, there were a number of yellow flags throughout the track. I was used to it now and found a rhythm even though there were many big wrecks in the night. One MINI caught fire big time and there was a pile up with an SLS and a GT3R just after the Karussel. ES: As always Torsten gives energy and support – “Viel Spass” – Have Fun! TM: It’s a long wait for the fuel but it’s nice to have a second to make sure everything is ready to go before you leave the pits. TM: The lights on the car were pretty good. We were able to see the important bits but it’s very dark on track so there is definitely some areas that you have to guess some. 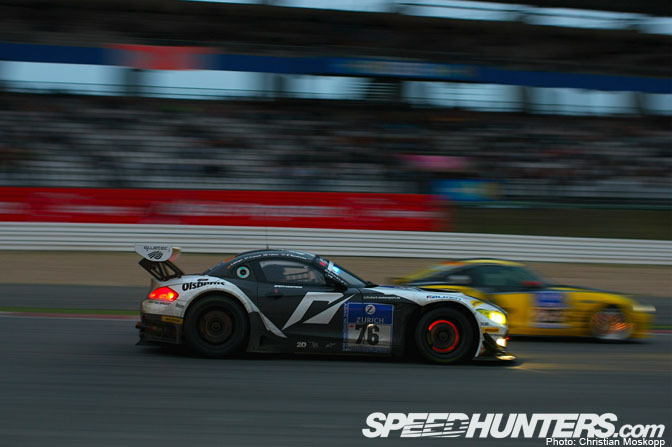 TM: Off for another standard Nurburgring stint, which consists of something akin to controlled chaos. ES: I’m pleased but maybe I used a bit too much fuel. I think slowing down a bit more in traffic cost fuel, but also increased safety. I had to think of how to improve that anyway. 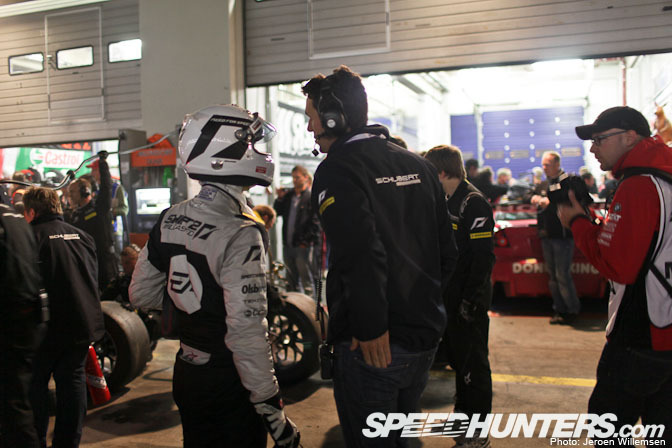 Patrick Söderlund who is responsible for the Team Need for Speed was together with our engineer Stefan Wendl doing all strategy work. He just informed me about pace, fuel and other thoughts around my stint. 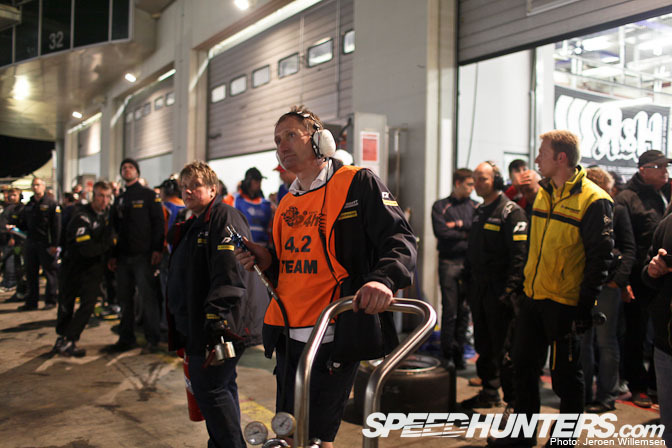 Patrick picks up fast, so it’s a great help to have that sort of a person behind the pit wall. 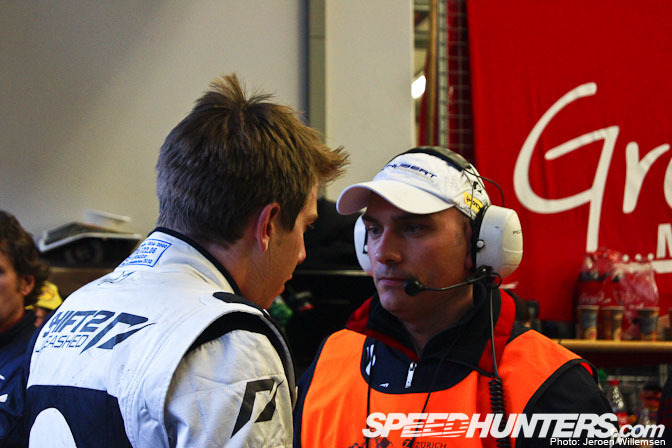 ES: As you can see I’m sweating a lot during my stints. I get red headed and maybe it looks like I need more physical training, but it’s just me. I felt in a good shape, but just have to think about not getting dried out and put all the ingredients back in the form of water and electrolytes. In the picture I’m surrounded by two Swedish fans. Lars to the left is a real karting hero in Sweden and a true motorsport fan. ES: Following the screens to see how everything is going, I just had two hours before my next outing. My sleep time would be a bit later. 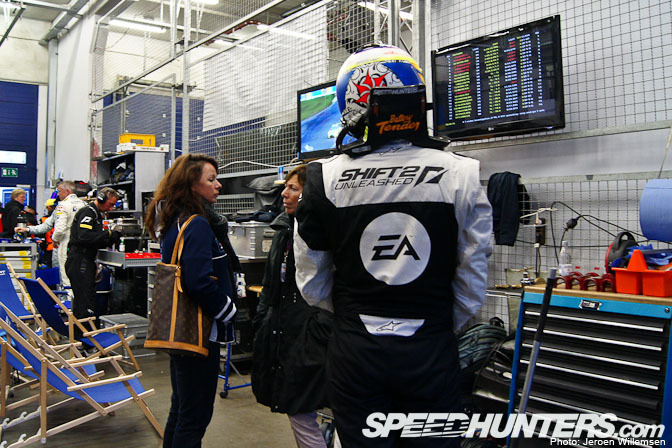 I was about to prepare for my first double stint. 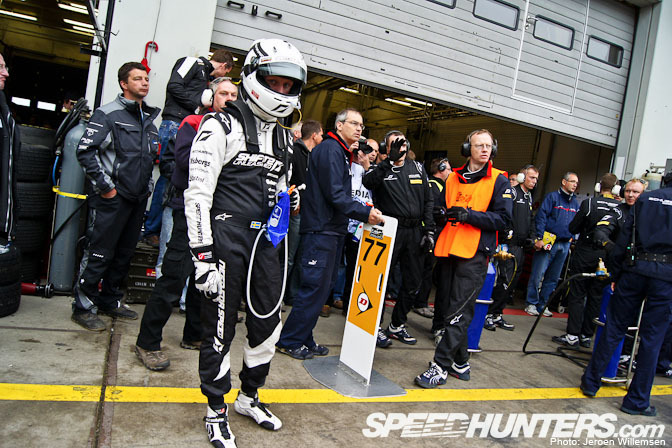 I have to be honest to say it’s hard work driving the car at maximum speed during a double stint, but I was prepared. TM: Finally! 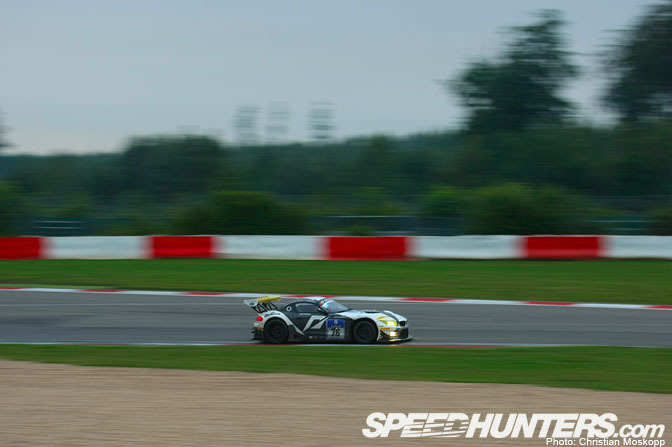 A stint that wasn’t swamped with yellow flags. At this point, we were running top 3 really after the pit stops cycled through. We were in a great position and we were running quick laps. I had one moment at Pflantzgarten where I was passing a car going very slowly. It was dark and I wasn’t exactly sure where I was on the track. 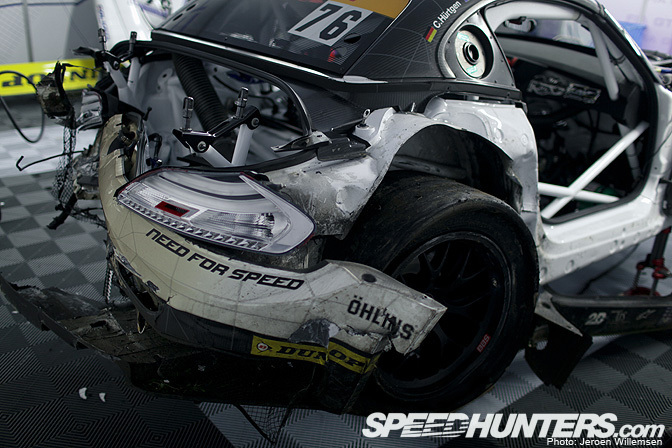 As the car got air, I lost control of the car for a moment and drifted wider than I wanted. I opened up the steering some and just dropped the right side off the track in the grass. I was able to get right back on but I had packed the right front duct with grass. Otherwise the car was fine. 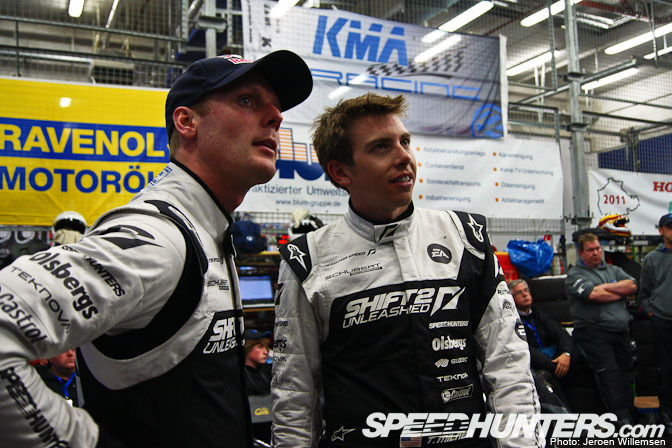 TM: I pitted in 2nd place and handed the car over to Fredrik. It was very late at this point, 2AM, and I headed back to the hotel to get some sleep. 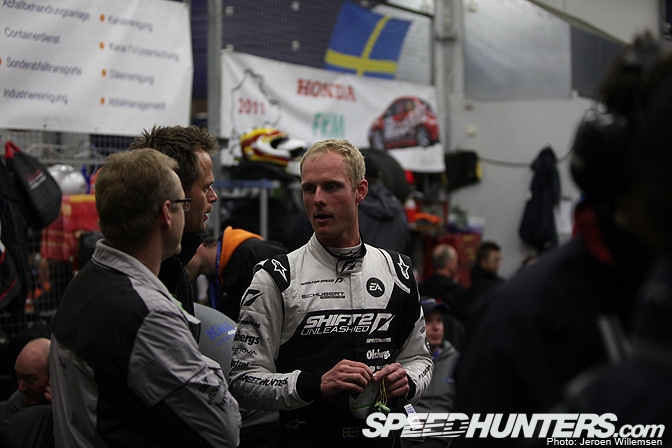 ES: Fredrik was storming on the track and was from time to time fastest on the track. I was about to get ready with only more two laps to go. 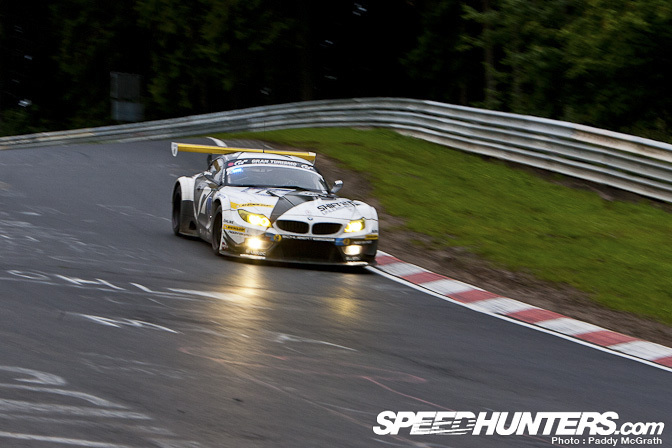 We were in the hunt at the Green Hell. My head only told me what I learned in Dubai, that the race restarts at 07.00 and you still have to be in then to be able to win. ES: What can I say? It’s like being totally empty. All adrenalin goes from top to down. I couldn’t really think. I was just totally disappointed, but the only good thing was that Fredrik was unhurt. ES: You don’t want to talk. You just want to turn back time, but you can’t. It was over. ES: The dreams of glory were taken away in a second. 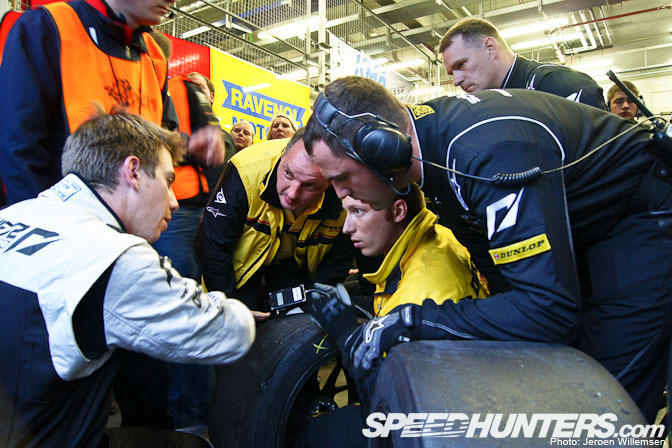 All the passion from the mechanics you even more understand when the race ends prematurely. TM: I got a call soon after I had fallen asleep that we were out. I knew anything could happen to any of us out there, but it was tough to hear the news after we had had such a strong run to this point. ES: It was a massive accident just before the Pflanzgarten corner. Fredrik tried to pass a Mercedes but there wasn’t room enough and the track is quite tricky there especially in the night. 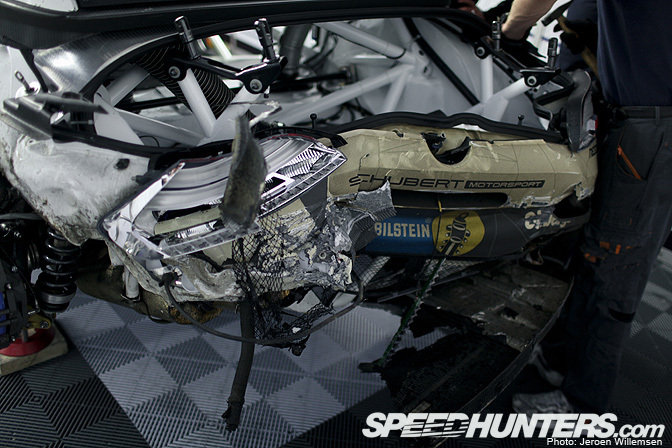 ES: I just spoke to Stefan about the chassis and it took the guys at BMW Motorsport in Ringsburg 200 hours to repair it. 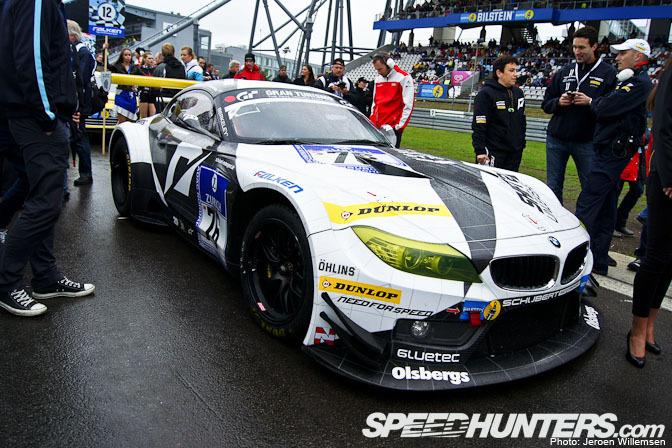 We will have it back for the FIA GT3 race in Bratislava in August. I miss it. My chief mechanic Rene also misses it I can tell. It was his baby. But soon it will be alive again! 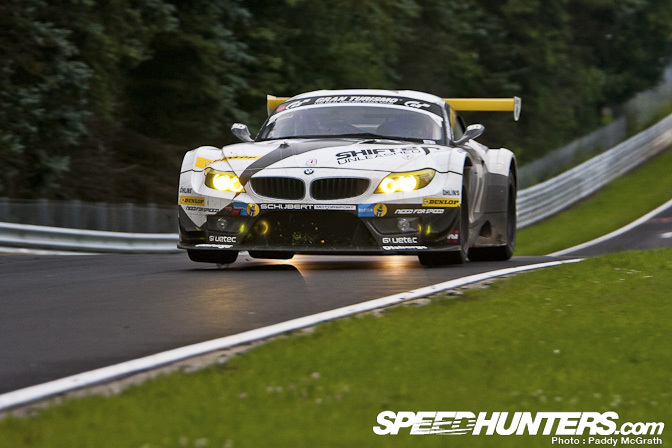 TM: I left the Nordschleife with such a huge respect for the track and land. For me, there really is a no more challenging and ultimately enjoyable track to drive in the world. 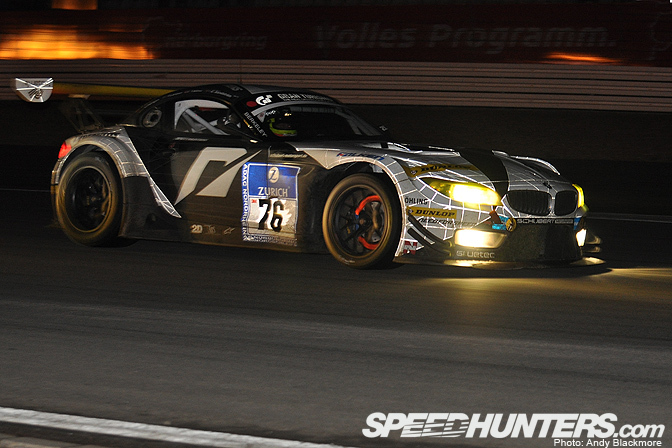 The 24 hour event is one of the greatest races in the world. 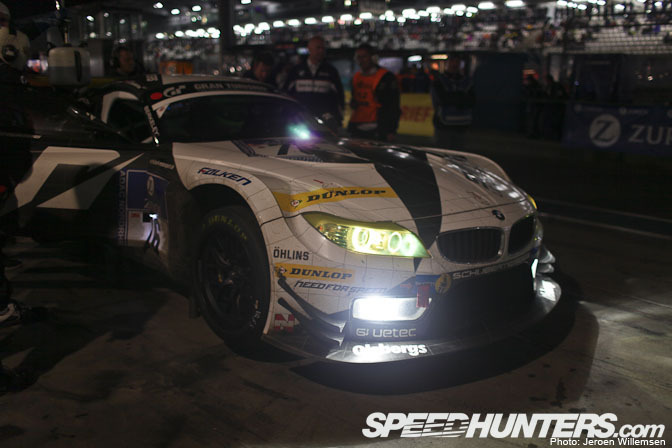 As a team, Schubert and Need for Speed can be very proud of the job we all did. The team proved they are one of the best in the world. It’s a pleasure to drive with such a great team. ES: The Green Hell will bite you just as soon as you loose a fraction of concentration. 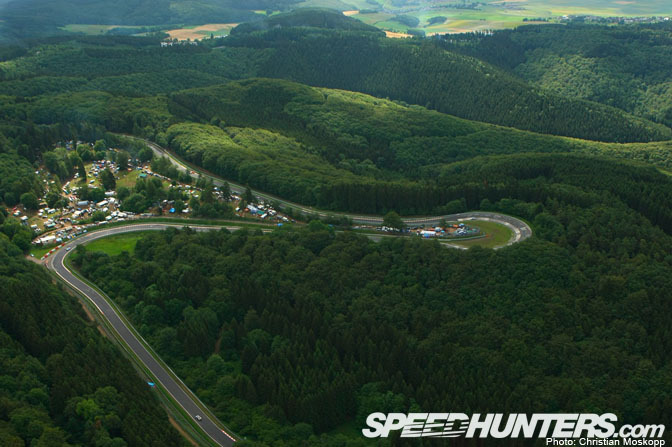 But from this view maybe it’s the greatest places for those who like to drive cars on the limit on a track. 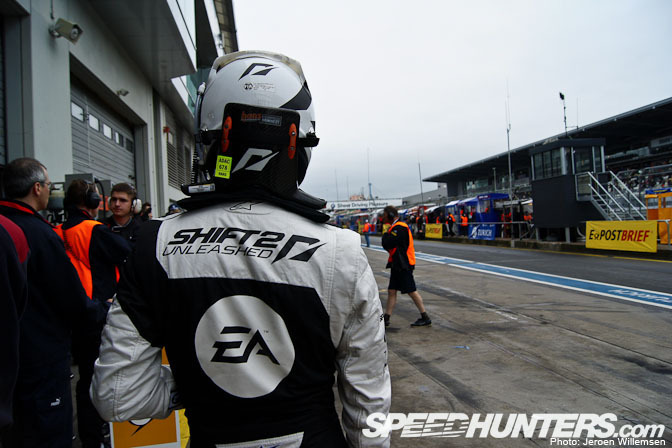 A big thanks to Team Schubert, the whole Team Need for Speed and all 17 millions fans who followed us at Facebook. We will be back! love the in-depth look at what goes on - especially with the tyres! Thanks! Nice write up. I was up late scooting around different parts of the track when the accident happened. We heard it, but did not see until later in the AM. Sorry to hear! The ring...what a beast! I think the sweating and turning red thing is part of being a nordic blonde. great article! it's nice to get a walkthrough of the event from one teams perspective. for many of us, this is as close as we'll get to knowing what it feels like!